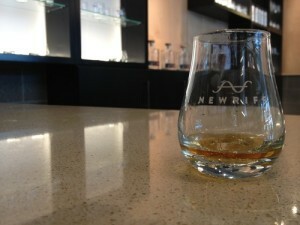 Over the weekend I visited the newest stop on the Kentucky Bourbon Trail Craft Tour, New Riff Distillery in Newport, Ky. New Riff really is new: On Saturday, the very first batch of bourbon was being distilled under the eye of master distiller Larry Ebersold, who has worked for Seagram’s and Pernod Ricard. 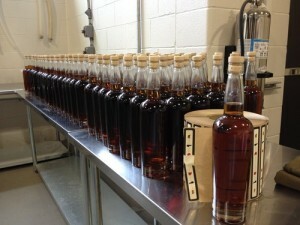 That bourbon will be ready to drink in four years. Until then, the distillery will bottle bourbon purchased from LDI in Indiana, and the first batch had been bottled the day before my visit. 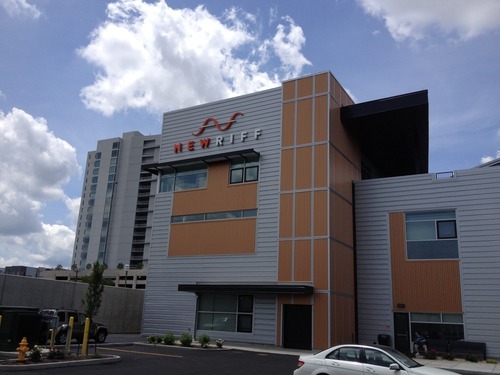 New Riff is located directly in front of The Party Source, the largest beverage alcohol store in the United States. Owner Ken Lewis sold the store to his employees so that he could operate New Riff and Ei8ht Ball Brewing, which is located in the back of the Party Source. The distillery building has a sleek industrial feel and is marked by the 60-foot copper column still in the front, above. The free tour, which lasted about an hour, included all aspects of the operation, from grain receiving to bottling. We learned that New Riff’s bourbon mash bill is 75 percent corn (sourced from the Charles Fogg farm in Decatur, Ind. ), 20 percent rye and 5 percent malted barley. A fun “Grain Story” poster noted that each batch of bourbon will use enough corn for 69,372 bags of popcorn and that the amount of rye in each batch weighs as much as a walrus. The barrels will have a No. 4 char, the heaviest char. 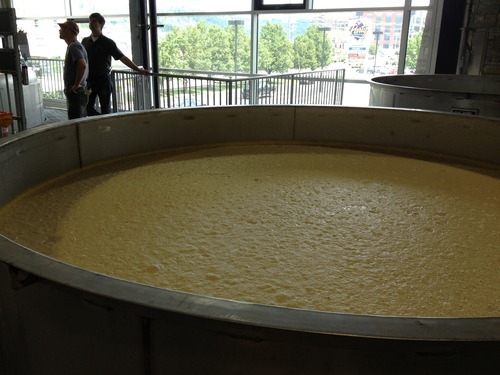 Yeast was busily working on the sugars in the fermenting tank; we could feel the heat coming off the bubbling liquid, which we were encouraged to taste. The impressive column still, made by Vendome in Louisville. 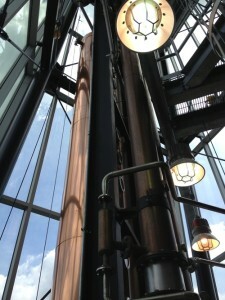 A smaller pot still will eventually be used for small batches and other spirits such as gin. The first bottles await labels. 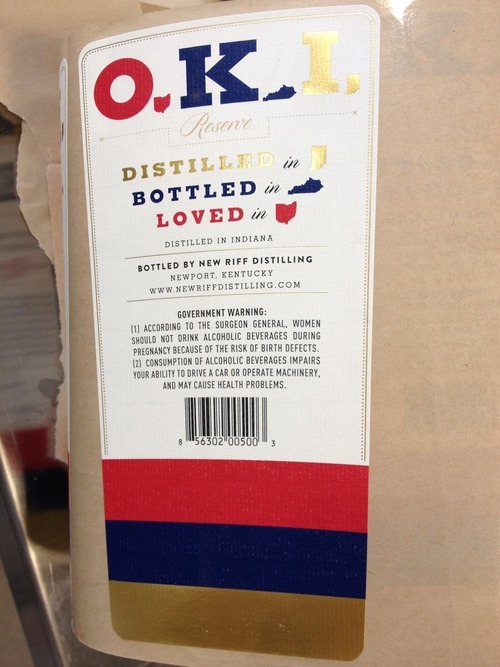 The whiskey will be called O.K.I., representing the states where it will be distilled (Indiana), bottled (Kentucky) and loved (Ohio). We tasted the 102 proof, 9-year-old whiskey in the first-floor tasting room. It had a sweet, kettle-corn front and a peppery, minty finish. A few drops of water brought out a spruce quality in the finish. 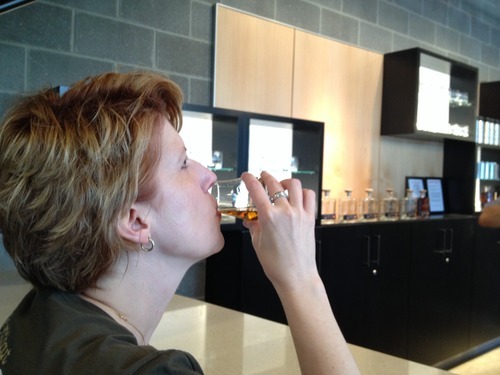 For $60, you can join the distillery’s Ranger Program and become a New Riff Ranger. 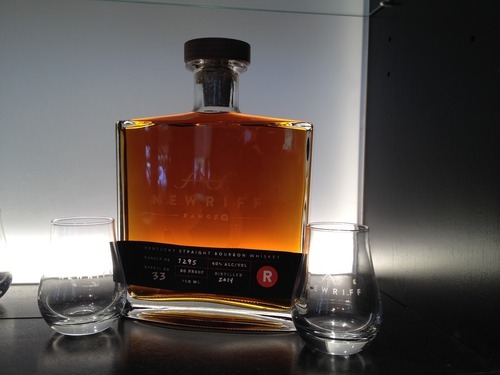 Rangers receive a newsletter, a discount in the gift shop, first crack at limited releases and, in four years, a bottle of single barrel New Riff bourbon distilled in the month that you visited. 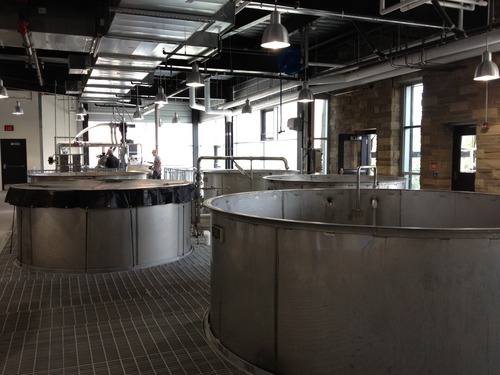 You are also investing in the distillery’s future. 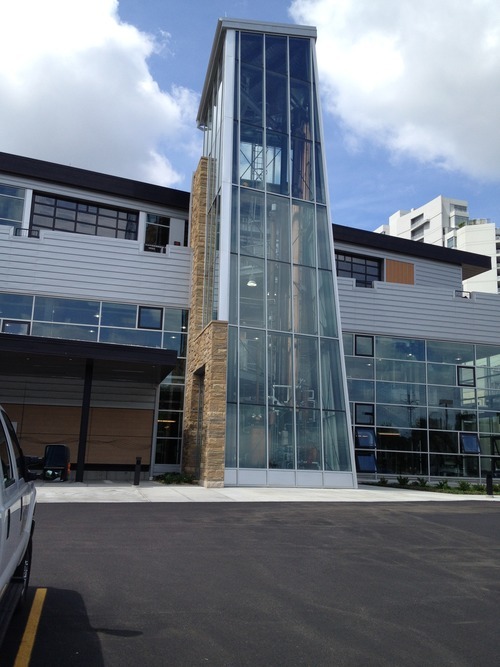 Enrollment will be open only during the distillery’s first four years. For more information, click here.